When I first discovered this game I was quite excited because it was a superhero game and I felt like I needed apps to fill my phone. A month later and while the excitement is less, it is still a fun game to play. Unlike most infinite runners, this one has a narrative or, to put it another way, a reason to run. The Joker and Gorilla Grodd team up to take over Gotham and Central City. As the title of the game suggests, you control Batman and the Flash to try stop the villains. Each character has their own arsenal to stop evil. Batman of course has his batarangs and Flash is able to create a whirlwind with his hands. Each has a use-counter which can be replenished by pickups. When you initially take the role of Batman you run through Gotham City – I assumed the batmobile was being repaired; you are dodging obstacles such as vehicles – stationary and moving, barrels and signs. There are other enemies in this game to take down and they change for the different characters. As Batman you face Joker’s goons. There are the standard goons which take one hit to take down, but then you also come up against larger henchmen that take two hits. Luckily for you batman has his trusty batarangs that can be used to take people down. The batarangs are required to take the bigger people because when Batman runs into people he only delivers one punch so you need to throw at least one batarang to take them down. When you are in control of The Flash for the first time, (Wally West version) you are in Gorilla City. This time you are required to avoid pillars, gorillas, floating bars and numerous types of vegetation. I personally find Gorilla City to be the more difficult of the two currently available because the obstacles and blockades seem to be more frequent and spaced closer together. The enemies also change; you guessed it, to gorillas. The one hit enemy is a “generic” walking upright gorilla and the larger enemies that take two hits are silverbacks. runner formula. However, the joker boss battle is infuriating because the character runs too close to Jokers tank which makes it very difficult to dodge his attacks. This can be tackled by the slow down time power up. Preferably in the next update that brings out new stages Gree. Inc could increase the running distance. This game features other playable characters both heroes and villains. 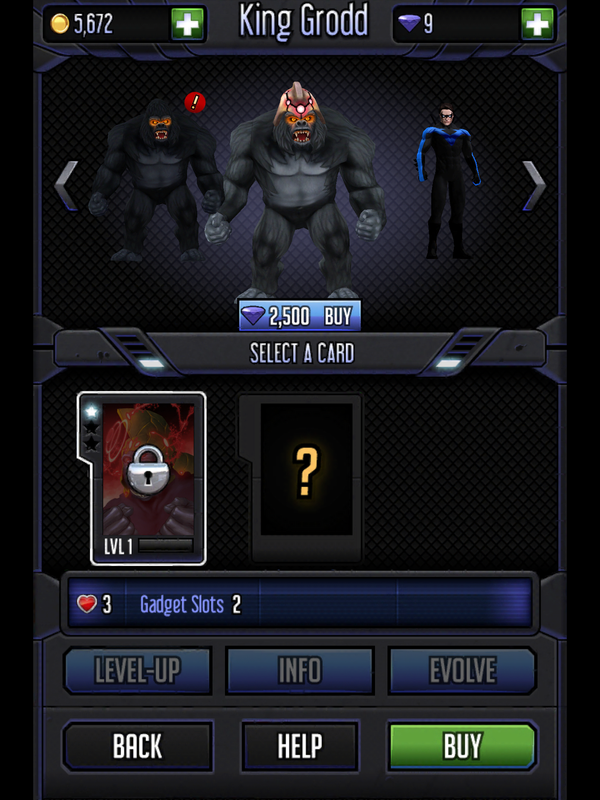 I have not unlocked any other characters but each has upgradable cards so it suggests that they have different abilities. The pickups in the game are the norm of shields, speed boosts, ammo boxes to replenish the characters attacks, coin multipliers and magnets. This game is not without faults though. As I mentioned in Zombie Killer Squad review infinite runners are beginning to be ‘quite tedious’ and Hero Run does nothing to challenge that. It is a fun game don’t get me wrong but they all play the same. In each of the menus there is a help tab which I really like because it makes the game easy to come back to if you stop. This game is worth checking out and is available on the app store and the play store. Should The Cowel Be Retired Or Passed On?